Steamboat Springs area residents will soon get a chance to pick the brains of scientists and conservationists on how to prevent the Yampa River from being ravaged by extreme weather conditions. A community discussion, “The Yampa Basin: Snow, Weather, Water and Our Future,” will be offered on Wednesday night at the end of a weekend workshop, which is being hosted by Colorado Mountain College and the University of California, San Diego’s Scripps Institution of Oceanography. 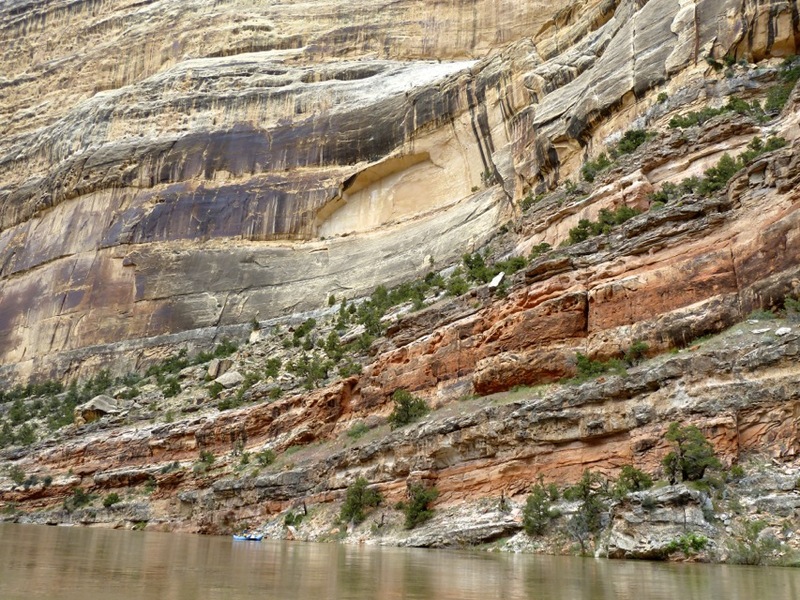 The Yampa River Rendezvous on June 5 and 6 will involve about 80 graduate students, post-doctoral scholars, researchers and water resource experts, who are traveling to Steamboat to study the Yampa River’s unique role in the Colorado River system as one of its wildest tributaries. “In San Diego, we get about 70 percent of our tap water from the Colorado River,” said Atmospheric Scientist Leah Campbell, a postdoctoral researcher with UC, San Diego and a scholar at the Center for Western Weather and Water Extremes. About 20 post-graduate students will be attending the workshop with Campbell. Where: Albright Auditorium at Colorado Mountain College Steamboat Springs, 1275 Crawford Ave. Exceptional drought conditions could force the town of Bayfield to tap into its reserve water storage this summer in Vallecito Reservoir. The town usually relies on water in the Los Pinos Ditch, but by July, there may not be enough water to fulfill the town’s water rights in the ditch, Town Manager Chris LeMay said. La Plata County is in the most critical drought listing by the U.S. Drought Monitor. The town’s reserves in Vallecito and its own reservoir are somewhat limited, which may necessitate purchasing additional water rights this summer, LeMay said. Bayfield spends $11,385 annually to lease 90 acre-feet of water in Vallecito, enough to meet the town’s average summer consumption for 45 days, he said. It can also store 30 acre-feet of water in the town’s reservoir, which could meet average consumption needs for about 15 days, he said. The town consumes an average of 2 acre-feet of water a day during the summer, he said. “We would definitely have to ratchet down our consumption,” he said. Drought conditions prompted the town to consider purchasing one-time water rights from the Pine River Irrigation District, as it did in 2002. A decision about purchasing similar rights this year has not been made. Annual irrigation limits began May 15 in Bayfield, which limits residents to watering their yards only every other day. A persistent drought could force Bayfield to institute more stringent irrigation restrictions. Residents are also prohibited from watering during the day from 9 a.m. to 6 p.m.
As the town has grown, annual water restrictions have helped Bayfield make due with existing water rights, he said. To serve a growing population, the town filed a case in water court to convert agricultural water rights in the Los Pinos Ditch to municipal and industrial water rights. If those rights can be converted, it would be enough to meet the town’s needs for the next 30 years. The water case, filed in 2015, could be decided this year, LeMay said. “Conditions will be favorable for the rapid growth and spread of fires,” the weather service said. 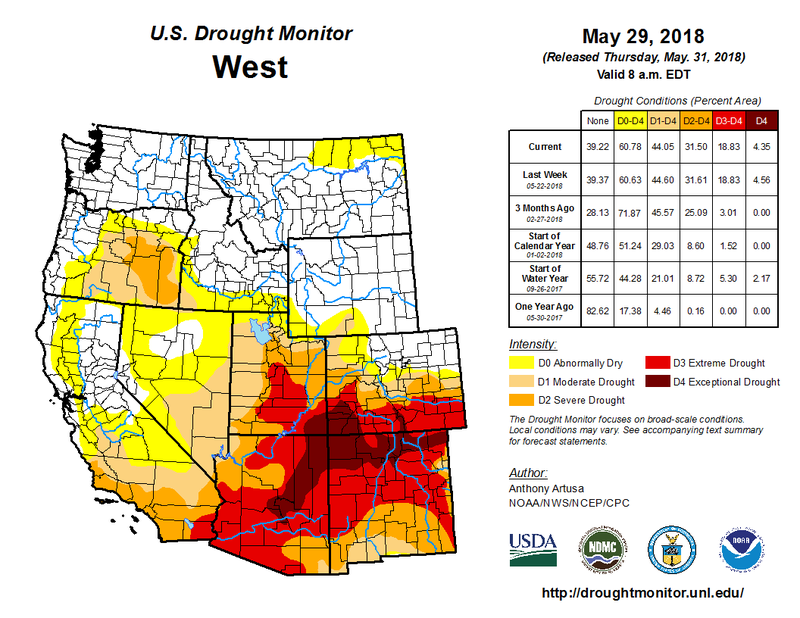 West Drought Monitor May 29, 2018.